Anyways, on to the reason that I am here. Today, I want to share with you all my take on a Pin-Up makeup look. I thought this would be something interesting for all of Hollie’s vintage-loving readers out there! I hope you guys love it! The first thing on the to-do list for this makeup look is to put on foundation. For this tutorial, I am mixing my Tarte Amazonian Clay Foundation with my Rimmel Lasting Finish foundation. I really love this Rimmel Foundation; however, it is much too dark for my skin so I have to mix it. I don’t mind mixing them, though, because once they have been combined, they make for a very long-wearing and matte face. I also used the Physicians Formula Conceal RX concealer to cover up any acne spots, dark circles, and redness. Because I have oily skin, the next step for me is to powder my face. Right now, I am using the Tarte Amazonian Clay powder foundation. I focus the powder mainly on my t-zone (the middle of the face) which is where I typically get the most oily. Next up, I will bronze/contour my face slightly in an effort to give the look of prominent cheekbones, then I move on to blush. For this pictorial, I am using Too Faced Milk Chocolate Soleil bronzer and Sleek’s Rose Gold blush. I also deepened the color of the blush a little bit by adding a little amount of theBalm’s Balm Desert. And here is the result after my bronzer and blush have been applied. Don’t forget to moisturize your lips like I almost did. I’m going to be applying a bright lipstick today, so I need my lips good and moisturized. For anyone curious, I’m using the Softlips cube in the vanilla scent that I got in my Influenster box a few months back. I also used a pink highlighter on my face that I received in this Ipsy bag. Now on to the eyeshadows. Prior to placing all of the shadows, I used Colour Pop’s “Glow” from KathleenLight’s collection all over my lid. This will act as a primer for the rest of the shadows to stick to. Today, I am using the Naked Smokey Palette by Urban Decay. (PS. I have dupes for all of the other Naked palettes [Naked 1, Naked 2, and Naked 3] in this blogpost!) I will be using all of the matte shades in this palette (i.e. the ones on the far right of the palette). I will also be using “Always Pearly Pink” from the L’Oreal Infallible shadow line all over the lid. I started out using the grey color from the matte end of the Naked Smokey palette. I placed this shade in the crease so that it will be easier to blend out the rest of the crease shadows when I get to that step. For a little added definition to the crease, I blended the brown shade from the matte end of the palette into my crease as well. We’re keeping the shadows super simple today, in preparation for the real star of the show. The eyeliner. I added a little bit of that L’Oreal Infallible shade all over the lid and also used the shade as a browbone highlight, which helped blend out the crease shadows. Next up is eyeliner! I’m doing a very heavy eyeliner today to go with that vintage-inspired look. For my eyeliner today, I am using my personal favorite – Revlon ColorStay Liquid Liner. It’s a staple in my everyday makeup look. Well, at least the looks where I use eyeliner. As for mascara, I used the L’Oreal Voluminous Butterfly Intenza mascara. This mascara also happens to be my current favorite. My lashes can sometimes be hard to please, but they love this mascara right now. You can see the difference below. After applying two coats to my lashes and doing my brows with the Bodyography Brow Kit, it’s time to finish up the look with the lips. I still have the rest of that SoftLips on my lips, so I grabbed a tissue and blotted off the rest of the SoftLips. The most important step after applying it is to let it sit on your lips. Since it’s been sitting the whole time I’ve done my makeup, I’ve allowed for the moisture to get deep down in my lips and do it’s job. Now, we need to blot off the excess. I decided to do something different and go with a berry-pink lip for this makeup look. If you prefer to do a red lip, be my guest. Do any lip color that makes you feel great! I am using Colour Pop Lippie Stix as well as the lip liner in “I (Heart) This”. That’s it for today, dear friends. 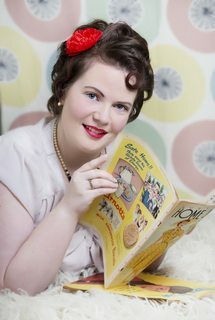 I hope you enjoyed my vintage-inspired pin-up makeup tutorial! Let us know in the comments section below, what is your favorite lipstick to wear when you are doing a vintage-inspired makeup look? I can’t wait to read your answers! And be sure to come and hangout out with my for a little while over in my corner, www.dearfriendsblog.com. I can’t wait to see y’all there!